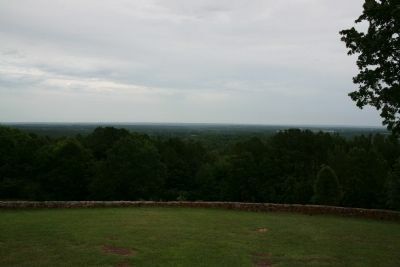 On this nine mile long ridge there are two historic lookout points which command a view of 30 to 35 miles. Between this site, with an elevation of 713 ft., and Point Lookout (1/4 mi. NW), lies a narrow valley. An Indian trail and later a pioneer road crossed this valley. The pass became known as McKee's Gap in 1846, after Thomas McKee led a group of Presbyterians here from Tennessee and began the town of Larissa (3.5 mi NW). Named by McKee's son the Rev. T. N. McKee, the village flourished as the location of Larissa College from the 1850s until the 1870s. Point Lookout was a popular recreational area for citizens of Larissa until the railroad bypassed the town and it declined. Around the turn of the century, John Wesley Love (1858-1925) bought this land and developed a 600-acre peach orchard. 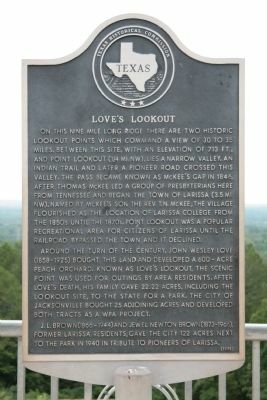 Known as Love's Lookout, the scenic point was used for outings by area residents. 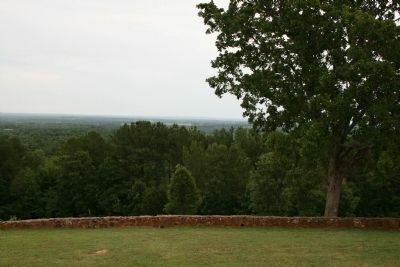 After Love's death, his family gave 22.22 acres, including the lookout site, to the state for a park. The city of Jacksonville bought 25 adjoining acres and developed both tracts as a WPA project. former Larissa residents, gave the city 122 acres next to the park in 1940 in tribute to pioneers of Larissa. Location. 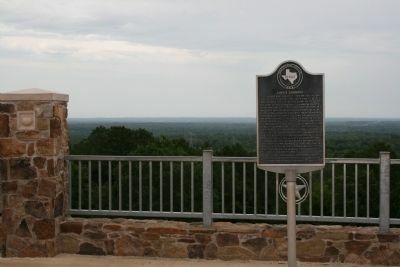 32° 1.765′ N, 95° 16.757′ W. Marker is in Jacksonville, Texas, in Cherokee County. Marker can be reached from U.S. 69 near Lookout Valley Road. Touch for map. 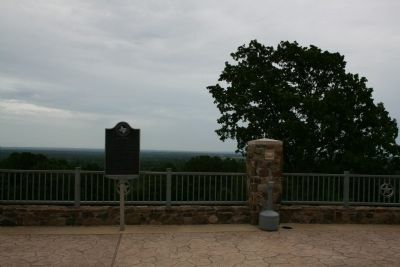 At the Love's Lookout Visitor Center. Marker is in this post office area: Jacksonville TX 75766, United States of America. Touch for directions. Other nearby markers. At least 8 other markers are within 12 miles of this marker, measured as the crow flies. Old Neches Saline Road (approx. 3.4 miles away); First Baptist Church (approx. 4.9 miles away); Earle's Chapel Methodist Church (approx. 7.2 miles away); Earle's Chapel Cemetery (approx. 7.3 miles away); Bullard Water Well (approx. 8 miles away); Craft Baptist Church (approx. 8 miles away); Cuney (approx. 8.1 miles away); Dewberry Plantation House (approx. 11.6 miles away). Touch for a list and map of all markers in Jacksonville. More. Search the internet for Love's Lookout. Credits. This page was last revised on June 16, 2016. This page originally submitted on June 9, 2010, by Amanda Hartley of Tyler, Texas. This page has been viewed 1,420 times since then and 20 times this year. Photos: 1, 2, 3, 4, 5. submitted on June 9, 2010, by Amanda Hartley of Tyler, Texas. • Kevin W. was the editor who published this page.